Is the “I’m going to be healthy” resolution already getting to you? It is me. Two weeks in. That’s about right. January 17, 2012 March 9, 2018 Categories FoodLeave a Comment on Is the “I’m going to be healthy” resolution already getting to you? It is me. Two weeks in. That’s about right. Well, here we are, January 16, 2012 and I’m craving a bag of potato chips, a baguette with a slab of butter, and a salted caramel to finish. My willpower is fading. And fast. Tonight I tried desperately to bring new life to the Tupperware full of grilled chicken breasts that were sitting in the fridge on the fast track to becoming focker food. I do want to eat healthier this year. It’s important for my family, for myself. I get it. And I’m committed to it. That said, I love food. I love cooking. I love a great meal with an amazing bottle of wine. So if this healthy thing is going to work, I’ve got to spice it up a bit. Surprisingly, my little experiment this evening worked. I took one of my favorite French recipes and lightened it up a LOT. I’m not quite sure of the calorie/fat count, but I can assure you it’s guilt free. And delicious! Try it for yourself. I know you are looking for things to do with those chicken breasts in your fridge. Heat the initial 3 tablespoons of butter in a 2-quart heavy saucepan over moderate heat until foam subsides. Whisk in flour and cook the roux, whisking, until pale golden, about 2 minutes. Gradually add milk and broth, whisking, and bring to a boil, whisking. Reduce heat and simmer gently, whisking frequently, until the sauce is silky and thick, about 25 minutes. Next, cook shallot in a tiny bit of butter in a heavy skillet over moderate heat, stirring, until softened, 2 to 3 minutes. Add mushrooms and cook, stirring, until lightly browned, about 4 minutes. Add this yumminess to the rue sauce, along with the cut up chicken breasts along with the thyme and white wine. 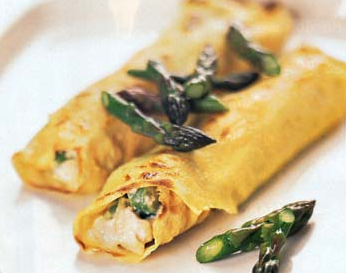 Blanch the asparagus and reserve to serve on the side of your crêpes. Sift together flour, salt, nutmeg, and pepper to taste into a bowl. Whisk together milk, whole egg, and yolk in a small bowl, then gradually whisk into flour mixture. Force batter through a fine sieve into a bowl. Don’t skip this step. It’s key to assuring you have lump free crêpes. Heat a dry nonstick skillet over moderately high heat until hot, I like to use the same one I cooked my mushrooms and shallots in, then brush very lightly with some melted butter. Spoon about ½ cup batter into skillet, tilting to coat bottom. Cook until underside is lightly browned, 6 to 10 seconds, then loosen crêpe with a spatula and flip. Cook until just cooked through, about 20 seconds, and transfer to a plate. Fill with the chicken filling, and fold crepe sides up. Serve with asparagus and a glass of white wine.